Vietnam’s economic growth was remarkable prior to 2008. From 2002 to 2007, it maintained respectable annual economic growth of above 7%, comparable to the growth of China and India. In 2007, the country’s gross domestic product expanded by 8.5%; the third consecutive year it surpassed the 8% growth benchmark. However, things were not as smooth as before. In the first half of 2008, Vietnam’s economy went through a rough patch. Rampant inflation, a rapidly widening trade deficit, a sharp stock market downturn and worrying signs of a lack of confidence in the currency had raised concerns of an economic meltdown. This was followed by the global financial crisis in the second half of 2008. Despite the rapid downturn in market sentiment in 2008, Vietnam’s economic outlook is not entirely gloomy. All thanks to Vietnamese leaders who historically have responded pragmatically when times were tough. In the first half of 2008, the authorities unveiled measures to fight inflation. Dramatic increases in policy interest rates, increases in capital reserve requirements for banks and mandated bond purchases by banks were efforts by the State Bank of Vietnam to control spiralling inflation. 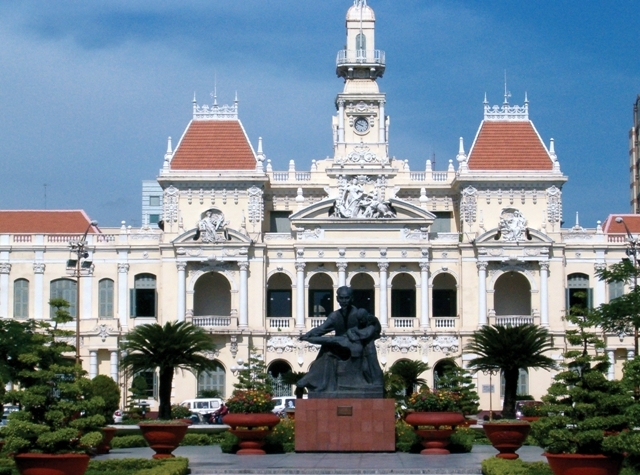 Within a year, many of the economic issues plaguing Vietnam in 2008 had abated. The inflation which peaked at 28.3% year on year in August 2008 had drastically moderated to 2% in August 2009 and is no longer a pressing concern. The threat of massive depreciation of the Vietnamese dong is over. Trade deficits have also moderated from a peak of US$3.73 billion in April 2008 to US$1.25 billion in July 2009. 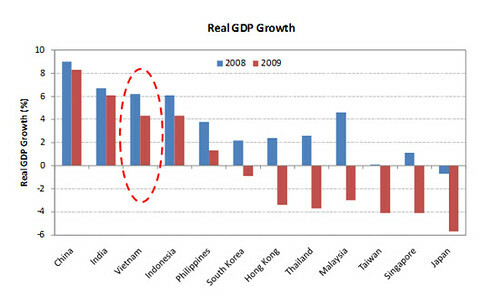 Vietnam appears to be weathering the global economic crisis better than many other Asian countries. In 2009, its real GDP growth is expected to be third largest in Asia – after China and India. This is in part strengthened by the government’s stimulus measures, including tax breaks and an interest-rate subsidy programme, which provided a massive boost to lending. The Vietnamese real estate market is growing in tandem with its healthy economic progress. Lack of supply amid growing demand for quality real estate space has and will continue to drive development and price growth in the coming years. Favourable demographics: With a population of over 85 million people, Vietnam is the 13th most populous nation in the world. Its population boasts a high overall literacy rate and is relatively young and well educated, all of which translate into a potentially attractive consumer market. Rapid urbanization: With Vietnam’s large and growing population, the trend, as with all other developing countries, is one towards increasing urbanisation. According to the United Nations (UN) Population Division, while only 85 million people lived in urban areas in 2005, that figure is expected to grow to 90 million in 2010 and to over 102 million in 2020. This works out to be a growth of over one million people in the urban area every year. Rapid urbanisation generates huge demand for real estate space, providing accommodation for the growing urban population as well as to house economic activities. Rapid urbanisation also means that cities such as Ho Chi Minh City and Hanoi, are experiencing faster population growth. With relatively higher population densities, apartments and condominiums will become an increasingly common form of residential development in these cities. Growing affluence: In tandem with economic growth, income has also grown rapidly in the past few years. Personal disposable income rose by close to 85% from US$260 in 2002 to US$480 in 2008. According to the Economist Intelligent Unit’s forecast, income will grow by 6% each year over the next five years. In addition, it should be noted that unreported income and wealth may be substantially more than official figures. The role of overseas remittances in driving the wealth and affluence of the Vietnamese should also not be ignored. Overseas remittances are an important source of additional income that serves to improve the living standards of the people, especially in key cities. According to the Overseas Remittance Management Department of the State Bank of Vietnam, money sent by overseas Vietnamese to their relatives via official channels amounted to US$7.2 billion in 2008. Increasingly, this money has been ploughed into real estate investments. Property as choice investment: Property ownership is considered a sign of wealth, a form of savings and a long-term investment. With the limited number of avenues for financial investment, investment in property is considered fairly attractive when land and properties maintain a steady growth rate. Moreover, property investment will offer capital preservation. Favourable developments in the legal and regulatory environment: Property ownership regulations were liberalised in 2001 when the Vietnamese government first allowed certain groups of overseas Vietnamese to own houses in Vietnam. The housing law was further liberalised in 2006 when more categories of overseas Vietnamese were allowed to own properties. Subsequently on September 1, 2009, the law was relaxed again. 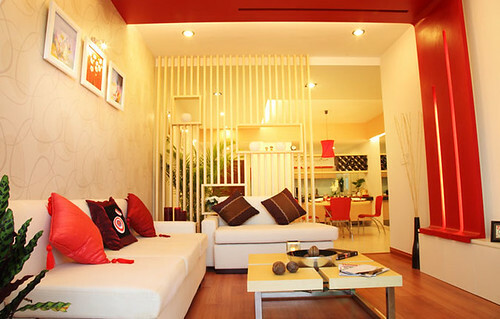 All overseas Vietnamese are now allowed to own houses, expanding the pool of potential buyers in the residential market. In another significant development, the National Assembly passed a resolution relating to foreigners purchasing property in Vietnam. According to the resolution, with effect from January 1, 2009, foreign individuals and enterprises who meet certain criteria will be eligible to own apartments in Vietnam for a period of 70 years. This will give an upside to the property market in Hanoi and Ho Chi Minh, especially given the large number of foreign organisations and individuals residing in these cities. The global economic slowdown, Vietnam’s high inflation rate and Government policy moves to curb inflation have resulted in the first down cycle in Vietnam’s modern real estate era and increased caution among investors, developers and other market participants. 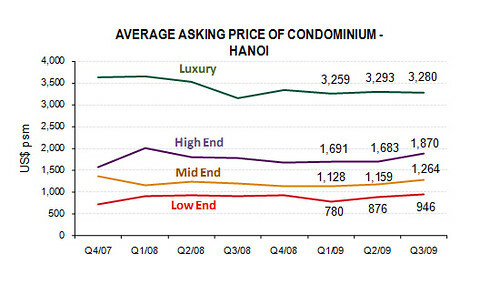 The residential sector in Hanoi and Ho Chi Minh City have seen capital values fall significantly, particularly in the luxury condominium market. However, the second quarter of 2009 witnessed a turnaround in the prices of all condominium segments after four quarters of continuous decline. In the third quarter of 2009, the prices of low to high end condominiums continue to gain momentum. 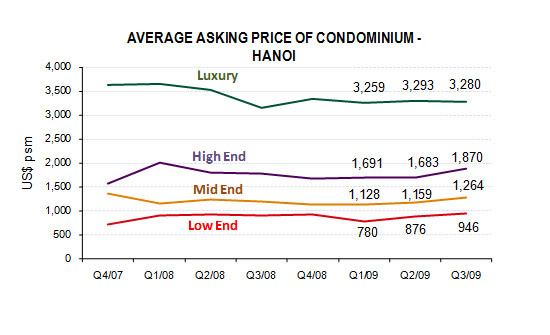 In Hanoi, the condominium prices went up by 8% to 11%, while prices in Ho Chi Minh increased by 1% to 3%. 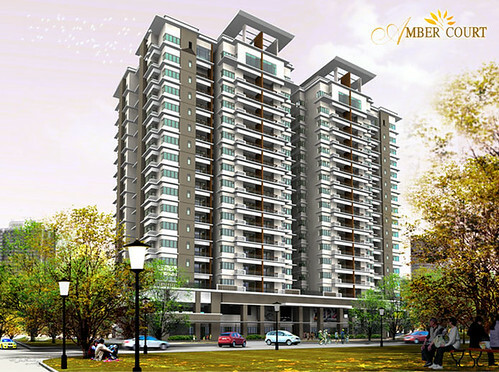 As for Amber Court, with a total land area of 2,905.65 sq.m with the proposed plot ratio of 1:5.5. The proposed building plinth is about 57.9% of the development, while the landscape and circulation is about 42.1%. 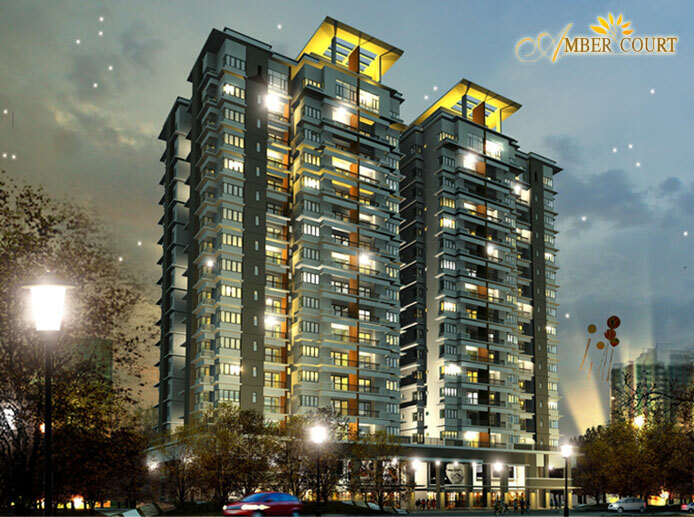 There are 1 block of 17 stories apartment consist of a level of communal facilities at Level 1, with a total of 325.12 sq.m net area and circulation space of 707.82 sq.m. There are 4 units of shop, management and maintenance office, common toilet, services compartment, car park and vehicle drop-off area. While motorcycle parking is on Level 2 with a gross area of 1028 sq.m. 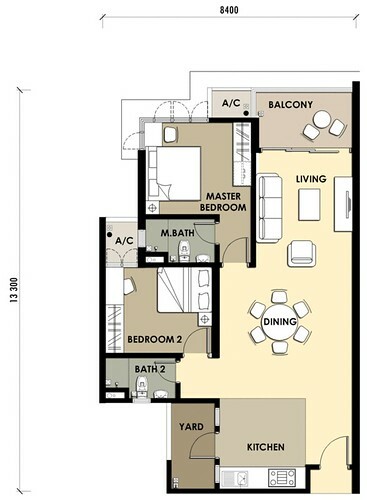 Typical Apartment is located at Level 3 to Level 16, penthouse is at Level 17. 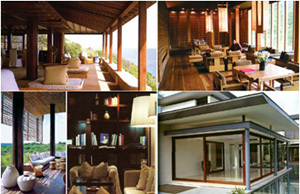 At Level 3, a private garden deck is designed serve the occupants. The living space at each level has a total area of 803 sq.m consist of 8 units of apartment connected by the circulation space approximately 180 sq.m with corridor approximately 2 metres width, 1 passenger lifts with lobby, an emergency lift and 2 emergency staircases is provided. 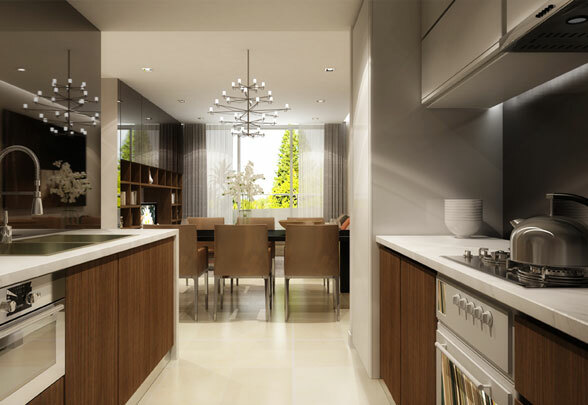 There are generally 3 types of design for typical apartment, and 2 types design for penthouse. 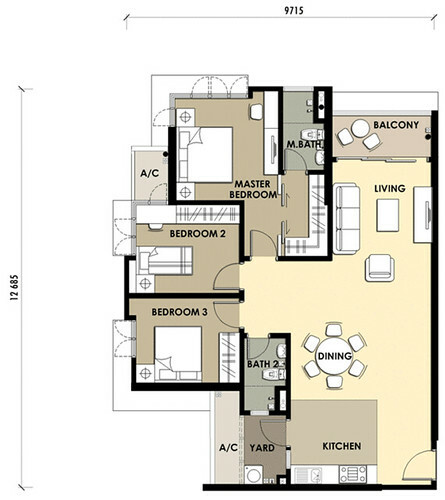 The sizes are 93.88 sq.m and 106.99 sq.m, penthouse are sizes 190.70sq.m and 220.86 sq.m respectively. 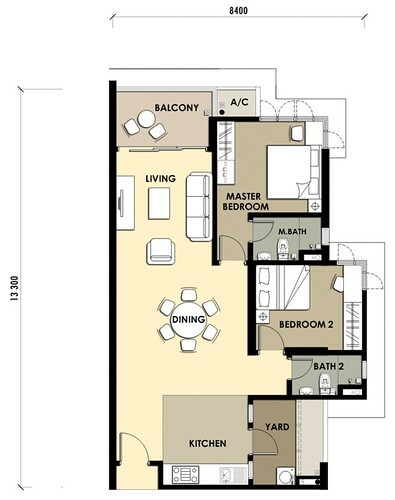 Each typical apartment has 3 rooms, 2 bathrooms, balcony, kitchen, yard and air-conditional compartment. The architectural expression inspired by contemporary architecture, combines basic shapes and simple lines to create a streamlined aesthetic, bringing a sense of modern life to the building. The building façade’s neutral white colour with strong red-orange colours highlights, aims to create a touch of originality and elegance. A flexible combination of materials; such as reinforced concrete, glass, steel, aluminium, reinforced lightweight concrete fins vertically and horizontally, plaster with groove lines finished with weather shield paint. All external grooves and corner return edges on finished plaster are to be constructed with beading for consistent finish. 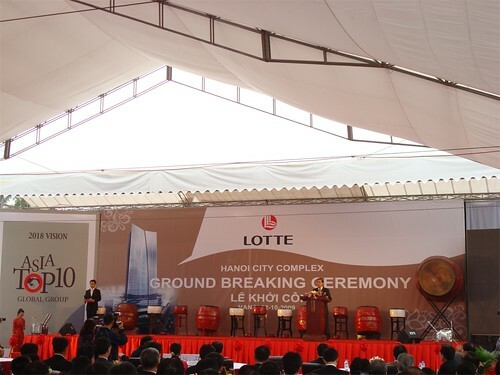 The groundbreaking ceremony of the 65-storey Hanoi City Complex, took place on October 22 in Hanoi at the attendance of many high-ranking Vietnamese and Korean officials. The $400 million, 267m high building will house department stores, a five star hotel, offices and serviced apartments. It is built on 14000sq.m of land. 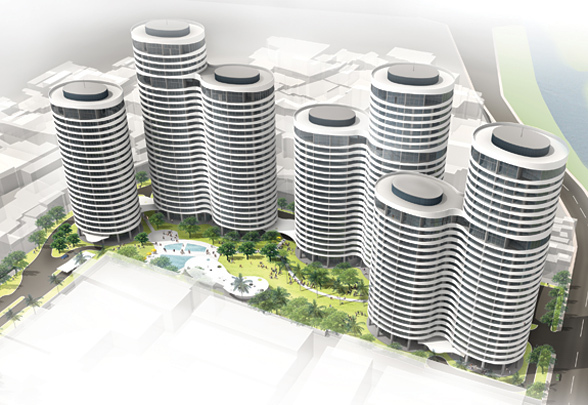 With 65 storeys, the building will have a total area of over 250,570sq.m. 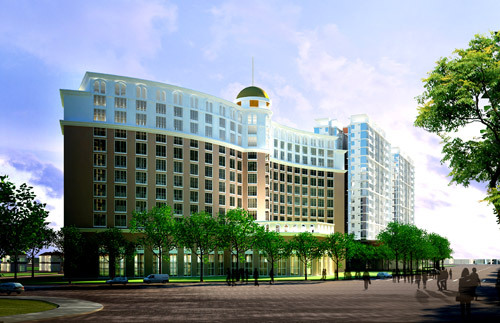 Architects believed it will be a symbol of modern Hanoi once construction is finished. Project investor, South Korea’s LOTTE Group, is the 5th largest economic group in South Korea. Established in 1965, Lotte is running its business in many countries, and Vietnam is one of the most important markets. Lotte aims to enter the top ten economic group of Asia by 2018. 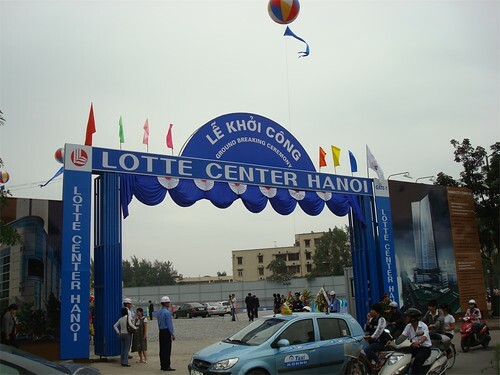 Lotte has become a familiar name in Vietnam with eight sub-companies running differing business comprising Lotteria Vietnam, Lotte Vietnam, Lotte Vietnam shopping, Lotte sea logistic, Lotte Vina International, Lotte Cinema Vietnam and Lotte E&C. Located on the Bien Dong Sea along the pristine southern coastline of Vietnam, InterContinental Binh Tien Beach Resort will become a world class premier destination resort offering a myriad of luxury accommodations and guest amenities. 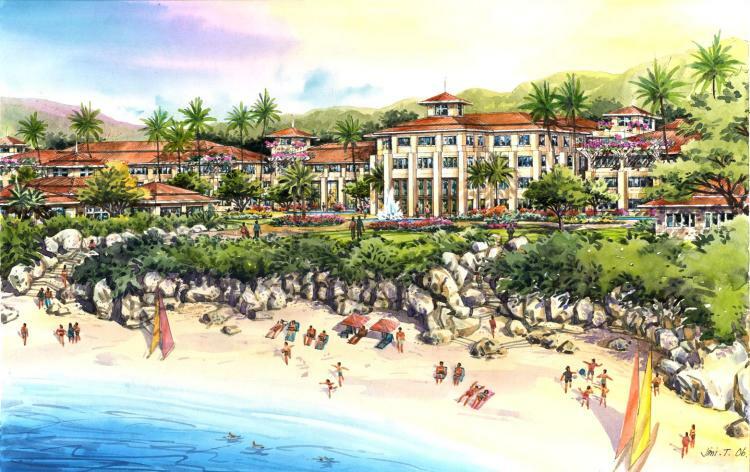 With 261 guest rooms, four restaurants, conference and spa facilities, the InterContinental Binh Tien Beach Resort will be the “jewel in the crown” of this exquisite Binh Tien property. The lush green mountains of Nui Chua National Park form the dramatic backdrop to the resort that overlooks a ribbon of spectacular white sand beach that stretches for kilometers along beautiful protected turquoise waters. Here, visitors will come to escape the hectic pace of every day life to enjoy the serenity and warmth of nature while experiencing world class, exclusive luxury resort services and amenities. 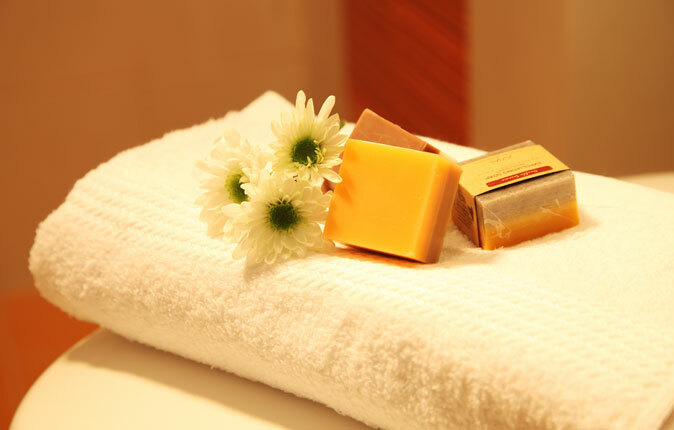 Located adjacent to the hotel’s main arrival area and a perfect location for greeting guests with cool towels and beverages after their journey to Binh Tien. 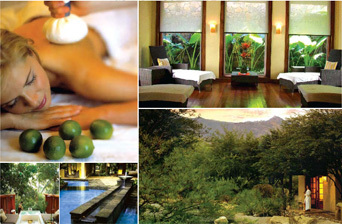 Comfortable and very open, this lounge will overlook the beautifully landscaped gardens of the resort. 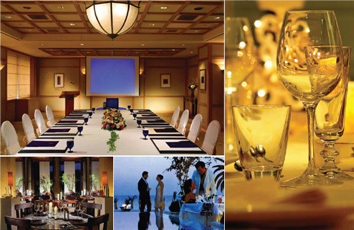 Beverages and elegant snacks will be available as guests listen to live music presentations. Conceived as iconic structures inspired by the traditional Vietnamese shrimp baskets, these are central features of the “Club Village” with its exotic and sophisticated setting. The Inspiration Space will have magnificent 360- degree views and provide quiet areas designed for guests to retreat, relax, read and learn. 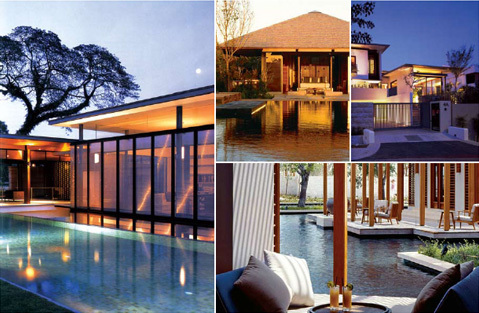 An elegant and inviting amenity featuring eight individual treatment pavilions and two couples’s treatment pavilions, designed for maximum tranquility and privacy. 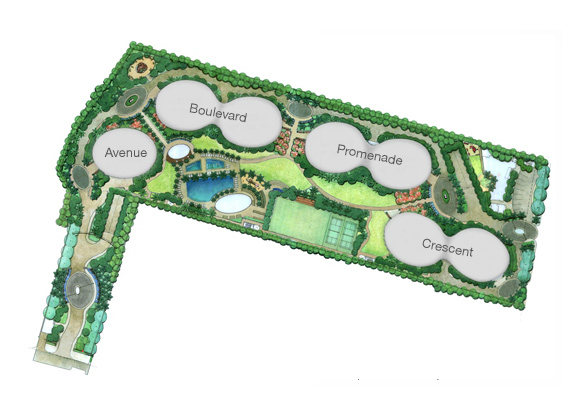 A complex of hydrotherapy pools will also be featured. The architecture of the Spa reminds us of the region’s heritage temple architecture such as that found at Po Klong Garai. Meeting rooms and a ballroom will look out onto a lush function lawn and garden. 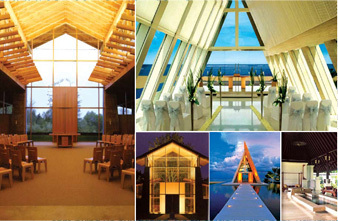 The banquet and function space is conveniently located near the “Luxe Village” in a slightly remote location suitable for large groups of non-resident guests. The Ballroom can accommodate a banquet for 1,000 guests. 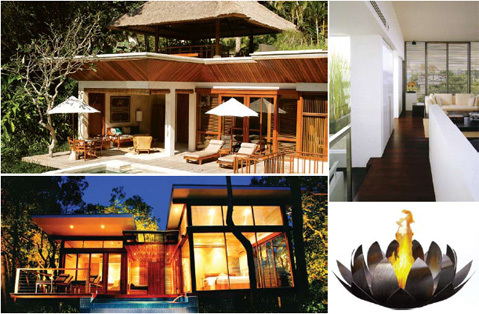 Landscaped courtyards and pavilions form the basis of the architectural design. Situated on the beach, this pavilion is surrounded by natural beauty and is designed as the perfect setting for memorable lifetime events. A floating promenade of natural stone leads to a building with soaring lines of wood and glass that is meant to evoke inspiration and meditation. Seating approximately 50 guests, the thoughtful décor will allow for all faiths and is conceived as multi-use function space. 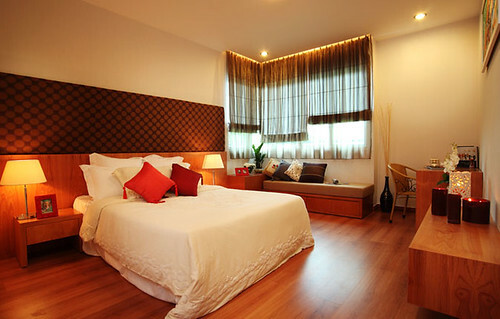 Each spacious guest room of 49 square meters features contemporary amenities and a unique layout emphasizing privacy and view. 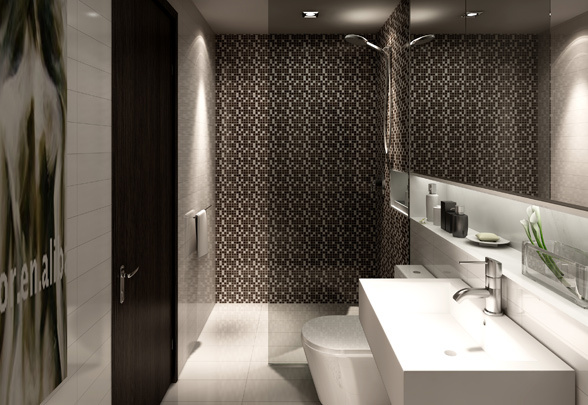 Materials are selected from sustainable sources and with beautiful timeless qualities. Luxurious bathrooms feature natural light and a soaking “tub with a view” on the exterior wall. 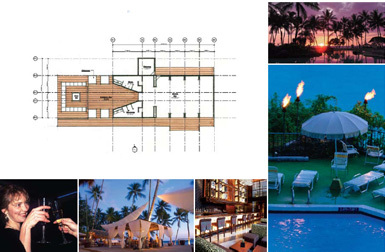 The orientation of the individual guest room buildings is purposefully angled with respect to the beach, giving each unit a unique view towards the sea overlooking various landscape and pool features. 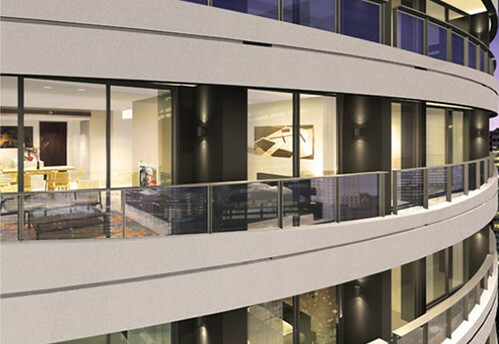 Many ground floor units can access swimming pools directly from the outdoor terrace. Others may experience lush landscapes and cascading pools. 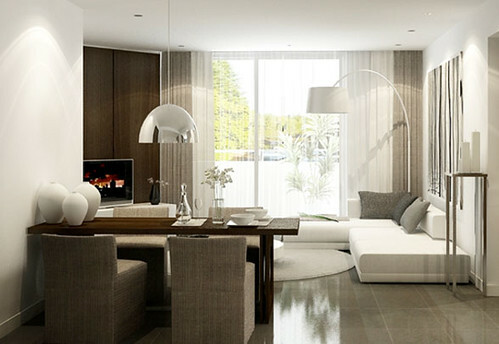 Suites of approximately 100 square meters incorporate a separate spacious living room and outdoor dining area. 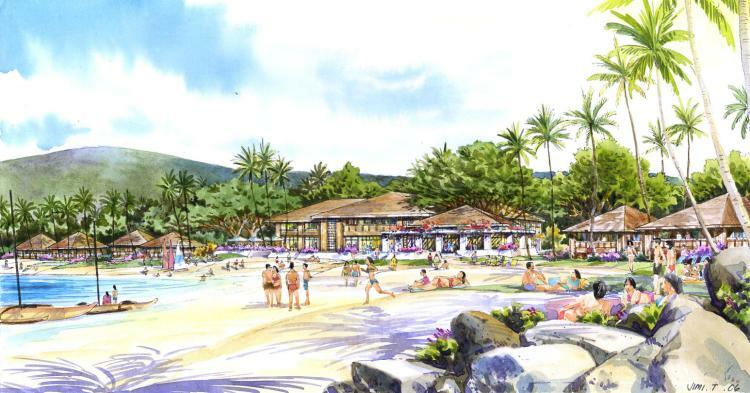 A gathering place for guests of the “Club Village,” this facility will also house the necessities to attract the more demanding international travelers. 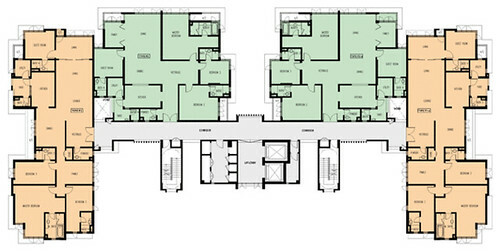 A library, lounge and meeting rooms will be supported by a cocktail bar, breakfast buffet, fitness gym, and limited office equipment. Contemporary and light pavilions connected by a common outdoor deck and bougainvillea trellis are the basis of this design. 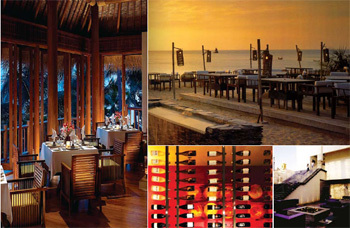 Located on the beach in the center of the property, this resort village themed restaurant will serve three meals each day based on a culinary concept of Asian and Western cuisines. 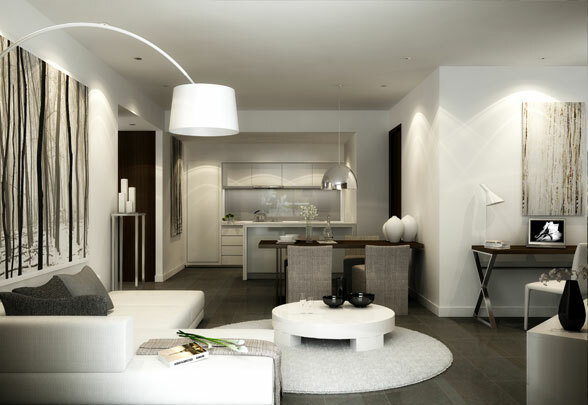 Varied types of seating will create a casual and welcoming ambiance. Large glass doors can open out to the dining terrace in good weather. More traditional, established family-oriented guests make up the population of the largest and most diverse of the villages. A quieter zone includes the Spa Village while the Reception Village leads to a more active family zone. 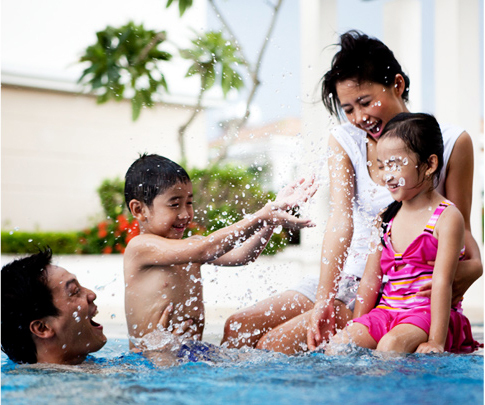 This village within a village is home to an exciting cluster of hildren’s pools and activity zones. 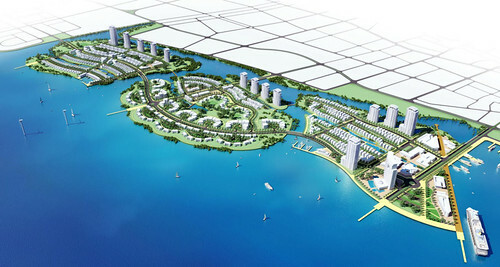 The traditional Vietnamese village along a ystem of canals is the reference point for the design of this resort area. The youthful set of successful executive guests find a place to both socialize and relax in an ultracontemporary setting. 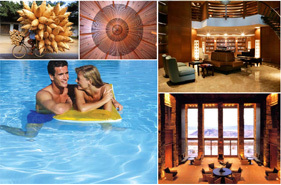 Central to the Luxe Village is a large “glamour pool” anchored by the resorts’ main specialty dining venue. This village is conveniently located next to the meeting and banquet facilities. Civic and religious forms would be the major architectural influences in this grander, more visible village. 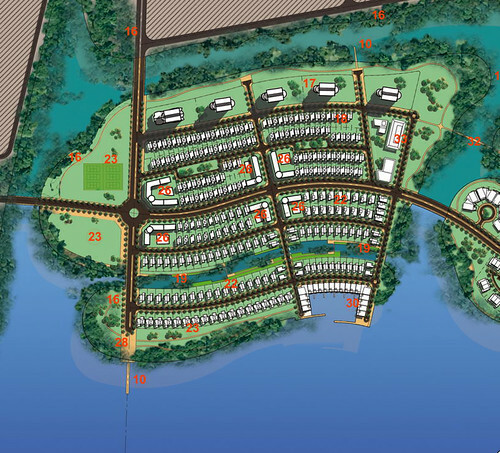 The site is 100 hectares located in Rach Gia, 250km south-west from Hochiminh City. The site consists entirely of reclaimed land in water adjacent mangroves. PTW’s design response is an archipelago of thress islands, which allows the free flow of sea water and its accompanying nutrients into existing and new planting of mangroves. 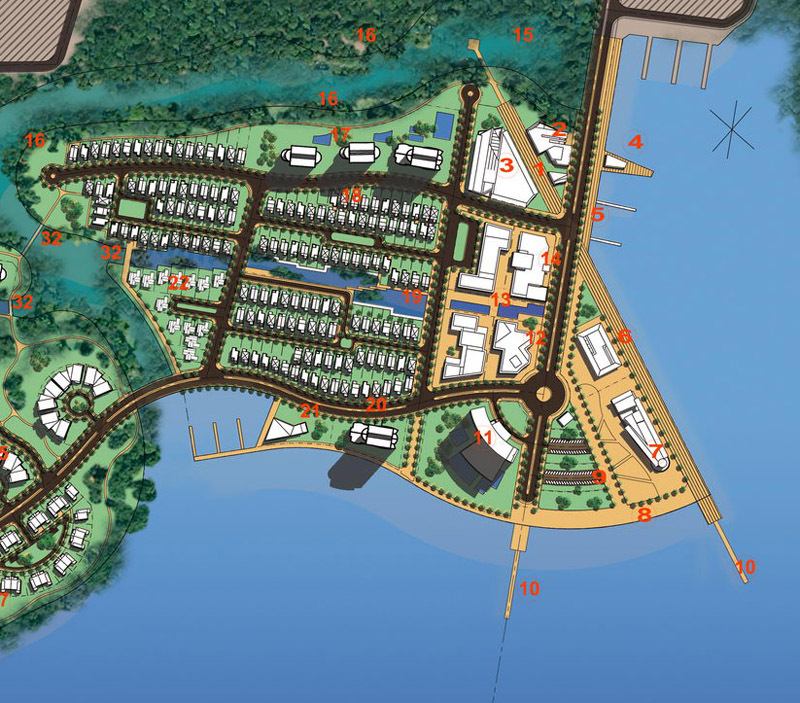 The south-eastern island – the closest island to the city centre – is the heart of development. An axis radiating from the People’s Commitee Building links the city centre to the water’s edge. 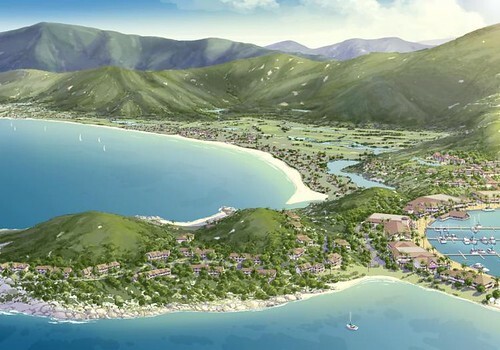 A wide variety of public land uses is present along the axis: a public promenade and a marina, shopping malls, entertainment and iconic hotels, and mixed use development. 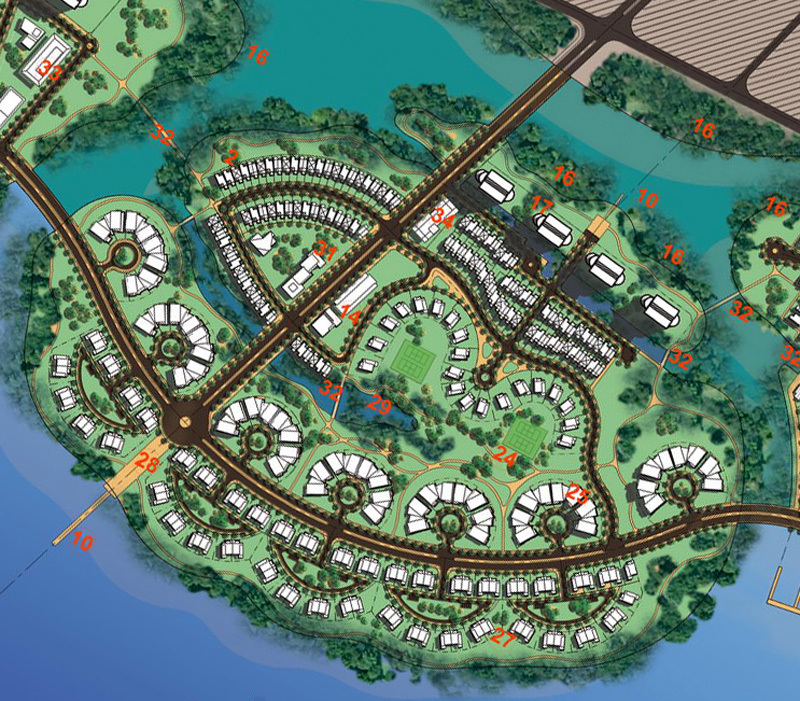 The other two islands of the development are designated residential precincts, comprising of villas, terraces and apartment buildings with waterfront views. Parks and internal water cannals are also woven into the masterplan design. 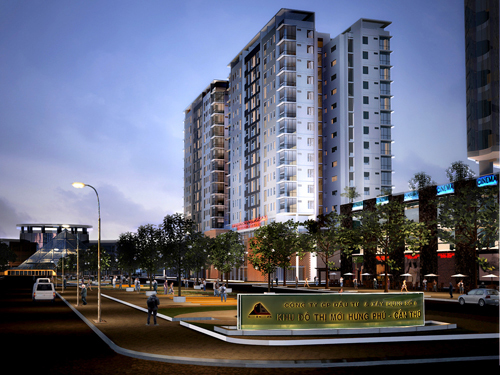 This approach provides a comfortable, unconventional and sustaintable precinct for approximately 3,500 residents. 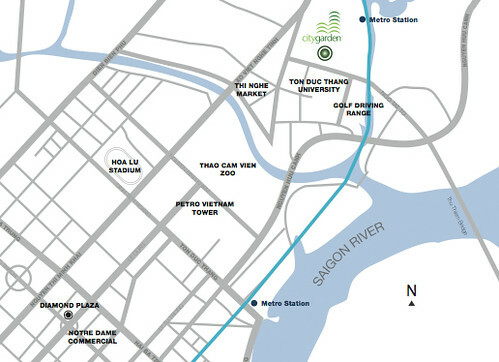 A sanctuary amidst the hustle and bustle of Ho Chi Minh city with lush landscaped gardens and a stunning new community, City Garden offers the ultimate in urban living. Exploring the interplay between light, texture, and tone – the interiors were meticulously selected to complement your personalized home decoration. 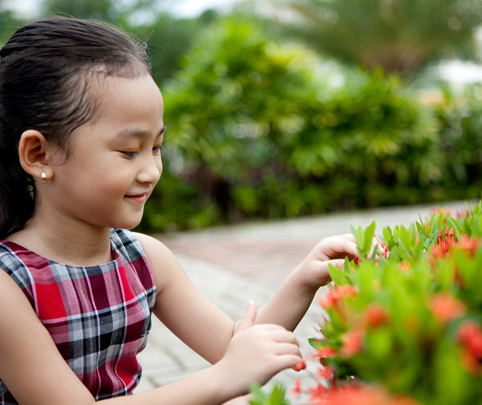 The luxuriant presence of green, the harmony of flowers and water features welcome you home – there is no other address in the city that can boast such abundance of active and passive green space for residents and friends to appreciate. Belt Collins, international landscape architects, uses tropical plants to create the scenic beauty and character that integrates harmoniously with the residential towers – a modern oasis so close to the city. 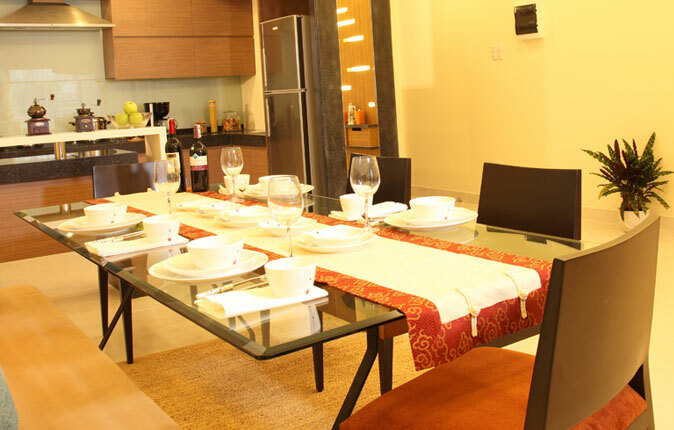 The resident’s clubhouse comes complete with health and relaxation facilities: swimming pool, gymnasium, spa, multipurpose courts and function rooms. Hung Phu Residence, South Can Tho River, at the lot 49th, Hung Phu Ward, Hung Thanh, Can Tho City, located in Can Tho City master plan in 2010 was approved by the Prime Minister. Land area is located convenient to urban transportation and artery transportation, to meet the requirements to develop a new urban area. 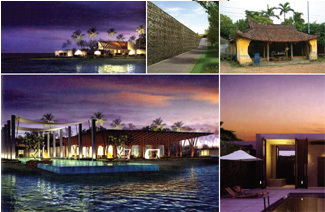 Phu Hung new urban development also created scenery for the South Can Tho River, increase attractiveness for all architectural areas and Can Tho City, is one of the places thrive on tourism. Absolute security: Professional management and security team who work 24/24 and always ready to solve problems immediately. 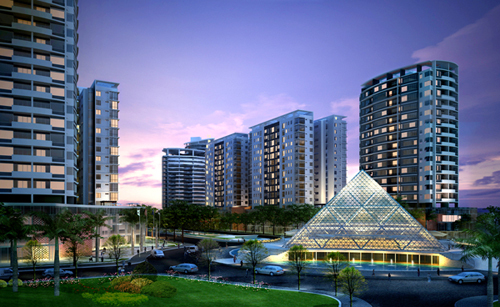 Pure living environment: The rate of 44% for plant and internal traffic in combination with many facilities as park, sport center, kindergarten, cultural house and so far, this place will establish a green urban with new modern and civilized living style. 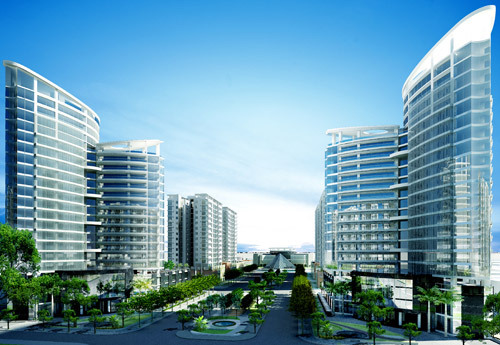 Urban landscape: Rows of high-floor building, which are designed modernly like hotel, supermarket, mall, office for lease and etc., are along the main street leading to the center, furthermore, in combination with natural green space and public facilities, they will give prosperous and beauty for whole area. 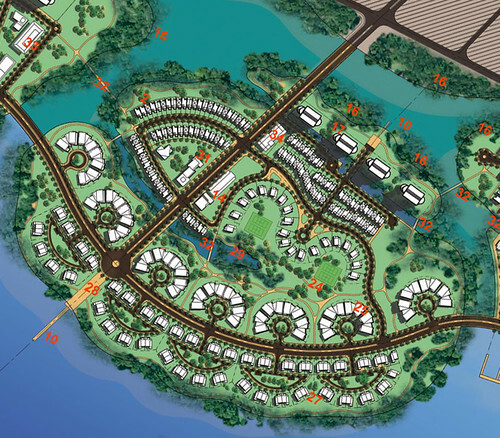 Complete planning of the project including villa area, townhouse, supermarket, hotel, apartment, office for lease, market, school, hospital, sport center, park, play-ground for children and etc. – Electricity system for whole area is underground and lead to each house. – Telephone and TV cable serve the area. – Peripheral lighting system is along the street. – Camera and traffic light are available at main crossroad. – Street and water system are constructed completely following standards of new urban.